Val Hall was the first Nurse Specialist appointed in 1995 to the then newly commissioned Adult CF Centre in Northern Ireland. She graduated in 2001 with a BSc Honours in Health Studies and has just completed her MSc in Nursing. She was one of the first nurses in Northern Ireland to qualify as a Nurse Independent and Supplementary Prescriber in 2003. 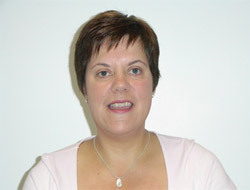 In July 2007 she was appointed as Regional CF Nurse Consultant.